The controversial appointment of Jean-Claude Juncker as President of the European Commission brought to mind two novels I read recently. Both could be described as Eurosceptic thrillers and feature the European Union greatly increasing its powers through the office of an EU President. I first wrote about Eurosceptic crime fiction for the British Politics Review and examined this increasingly promising genre through the works of conservative writers such as Andrew Roberts, Michael Dobbs and Alan Judd. Since then, I’ve been on the lookout for anti-EU novels by authors on the other side of the political spectrum. I’ve haven’t quite found them, but I have discovered an interesting diversity of opinion, i.e. degrees of Euroscepticism. Firstly, we have the Icelandic thriller Vulture’s Lair (2012) by Hallur Hallson. The 2008 economic crisis was particularly severe in Iceland, and their poor financial state prompted Iceland’s political class to discuss the possibility of joining the EU. This prospect seems to have filled Hallson with dread. Set in a dystopic future where the Icelandic Republic has been abolished and become a mere province in the ‘Great European Empire’, Vulture’s Lair includes a myriad of sub-plots, which mostly revolve around Krummi, a patriotic fisherman who begins the narrative making a minor protest in Brussels against EU regulations. Krummi is eventually spurred on to uncover a vast conspiracy with parallels to the assassination of JFK. Perhaps something is lost in translation, although its impressive to think that one in ten Icelanders have written and published a book, but I struggled through large sections of this novel. Hallson seems much more at ease propagating nationalism than other Eurosceptic writers I have read, and the novel is just bogged down by too much preachy flag-waving. That being said, there are some wonderfully diverting passages on Icelandic poetry and folklore, and the plot really picks up to an exciting climax if you can wade through the first two-thirds. Do you remember Nigel Farage’s ill-judged comments about people not wanting Romanian neighbours? 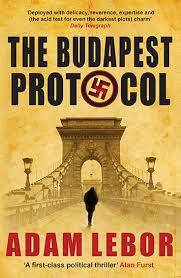 Adam Lebor’s The Budapest Protocol (2009) provides a nice antidote to them. Another dystopic thriller set in a Europe where the EU has greatly increased its power and the first directly elected President of Europe holds crypto-fascist views, Lebor wrote The Budapest Protocol to highlight the plight of the Romani or Roma people in Central Europe. Indeed, a donation of every copy sold goes to the Medical Foundation for the Care of Victims in Torture. 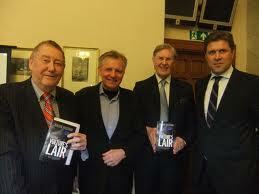 In the novel, Alex Farkas is a British journalist based in Hungary, much like Lebor. After the murder of his grandfather, Farkas begins to investigate a conspiracy centered round the titular document, which turns out to be an agreement signed by Nazis in the last days of the Second World War to create a Fourth Reich through a new economic empire (if you think that’s far-fetched read some of Lebor’s research on this issue). Part of the narrative concerns sinister plans to implement a mass sterilisation of the Romani population under the guise of being a fingerprinting program. Lebor is a writer who writes movingly and sympathetically about ethnic minorities. The appendix documents real cases of abuse against the Roma people including sterilisation. All in all, two very interesting Eurosceptic thrillers. Although if any readers could highlight some more examples from this small but growing genre I’d like to hear from you.